CLICK HERE TO CHECK YOUR (PRE)-REGISTRATION INFO FOR SUNDAY’s RACE HERE!!!! 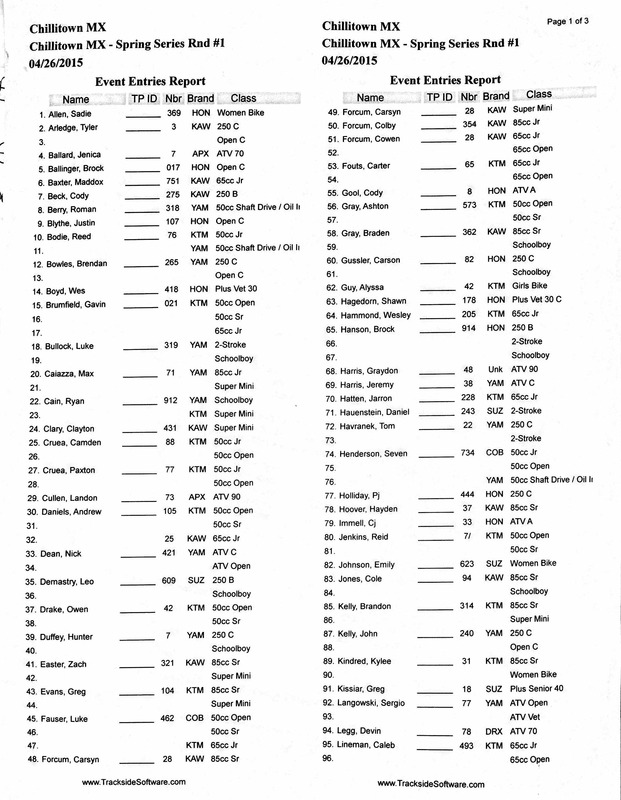 If you have pre-registered for Sunday’s Showdown at Chillitown (Sunday, April 26) please take a minute to look at your information and make sure that all of your classes and bike numbers are correct! If you are not entred correctly, you will NOT be scored correctly! Please double check and let the tent know first thing in morning if there needs to be any changes. If you do not see your name and you did register at the track today between 1:00- 5:00, then see Kim Forcum at sign up in the morning! or send the correction to 740-703-5791!! This is some thing new I’m trying to get the information out there to give you the opportunity to help us catch any mistakes before your race starts!! Opening race weekend at CTMX is quickly approaching, make sure you are joining us April 24-26 for our first race weekend of he 2015 season! Make sure to be following us on Facebook for some race week promotions! 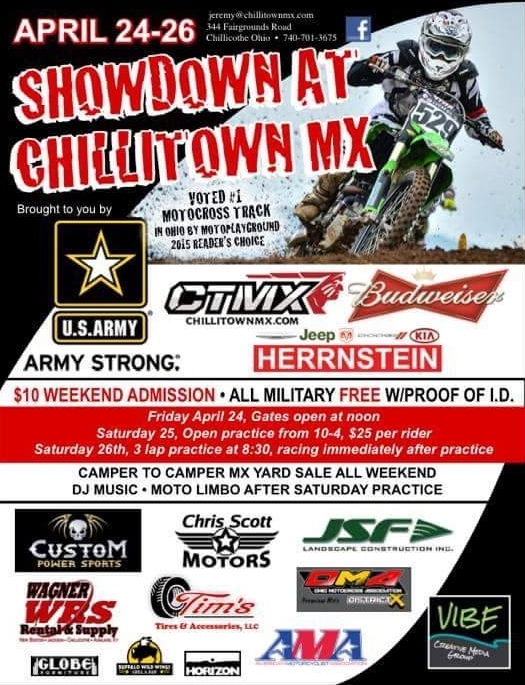 In one month from today the pits will begin to fill up for our annual Showdown at Chillitown! We are so pumped to officially announce our title sponsor for the 2015 season…….The US Army! They are coming onboard and have some exciting plans for the season. All military people will get free admission, with a valid military ID, to all three of our races! VOTE for Ohio’s Best track! Click on the link below to go directly tot the voting site! CTMX appreciates your support! GET PUMPED FOR THE LAST RACE WEEKEND AT CTMX! Check out the Battle video if you want to get pumped for the Halloween Weekend! Halloween Race Weekend at CTMX! 11p Quiet Hours NO PIT VEHICLES!! 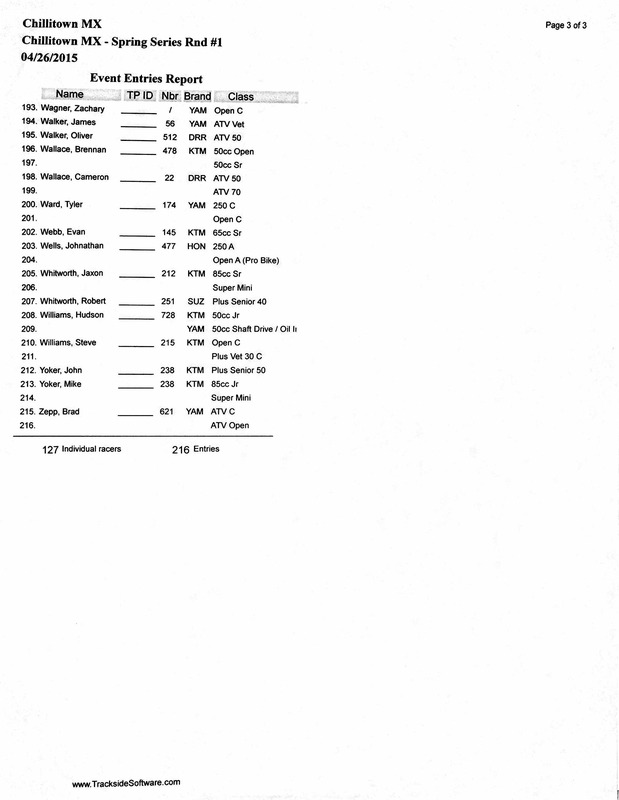 *Please refer to your Riders Meeting Handout!! There will NOT be a physical meeting so if you have ANY questions they need to be addressed before racing starts!! Payback is 200% for ALL Money Classes! 10:20- National Anthem, helicopter fly by and Cannons fire! 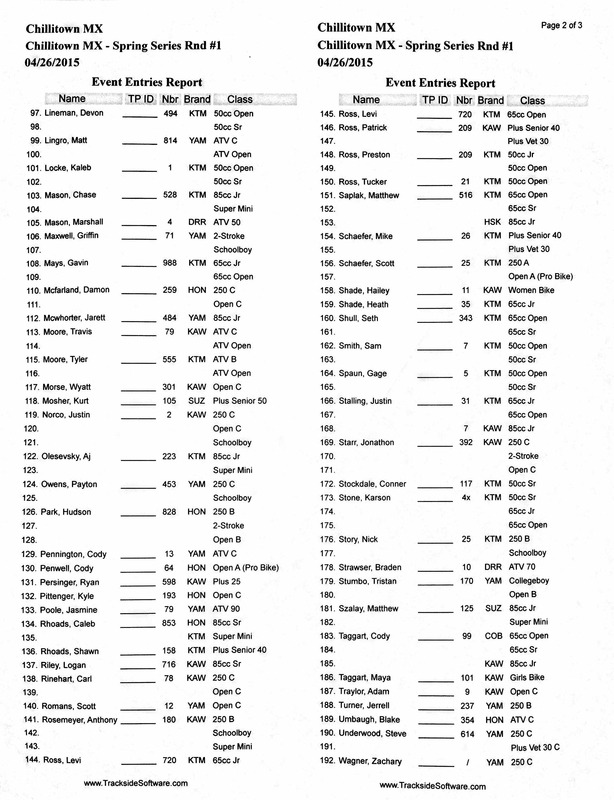 Please remember you must have a current OMA and AMA Memberships to race! Our local supporting Quality Inn is offering a 10% discount to all CTMX customers for this weekend only! Call them at 740-775-3500 or go to www.qualityinn.com to book your room today!